"The Breakbeat Bible is an indispensable resource for all students of hip-hop and contemporary funk drumming." 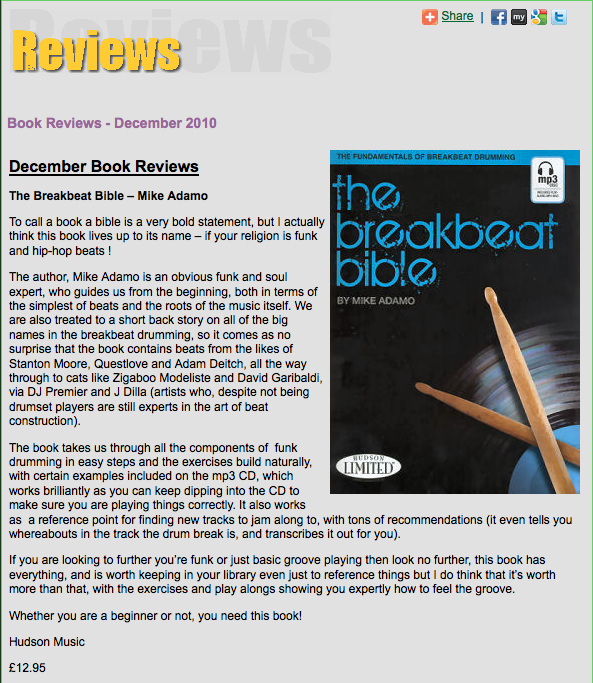 "Mike Adamo has really nailed it with his book "The Breakbeat Bible." A clear and concise method for developing grooves in this style with his 13 Elements system, tied with solid historic information and references to the architects who helped spawn the music. It brings together a variety of modern musical genres under one roof and points the way forward through greater drum set control." "Bout time somebody treated old break beats with the kind of respect they deserve. A great intro to a world of fresh beats that can be used in almost any context." "Very nicely laid out. A wealth of information from a cat who can really play. All the basics and all the subtleties, as well as a lot of interesting history. Mike traces the development of old school funk from the roots up to today; and he gives credit where credit is due - the funky dudes who laid it down!" “A well needed title on such a contemporary topic. This will set in stone how a drummer can learn and live with machines in a stimulating environment. My students love it too!" "The Breakbeat Bible, by Mike Adamo, is a great example of a musical collection of fun, exciting beats! It is historic and practical to learn...and really a 'must have' book. The CD included is a strong guide to learning faster. A complete inspiring book to discover endless beat ideas for many years of creative drumming!" "As an educational work, I think The Breakbeat Bible is a thorough, intelligent and superb contribution to the idiom. For me, it's a work that provides a bridge between Stanton Moore's Groove Alchemy & Johnny Rabb's Jungle Drum 'n' Bass-For The Acoustic Drum Set, but also has it's own unique angle and a very valuable one." "This is one of the most important books for any drummer at any level. These beats are not only the foundation for Hip-Hop, but the foundation for all modern dance music. Being able to play these recognizable patterns is essential for any drummer that wants to get a crowd on their feet!! Thank you Mike Adamo for doing such a thorough job and showing much respect to the art!!"